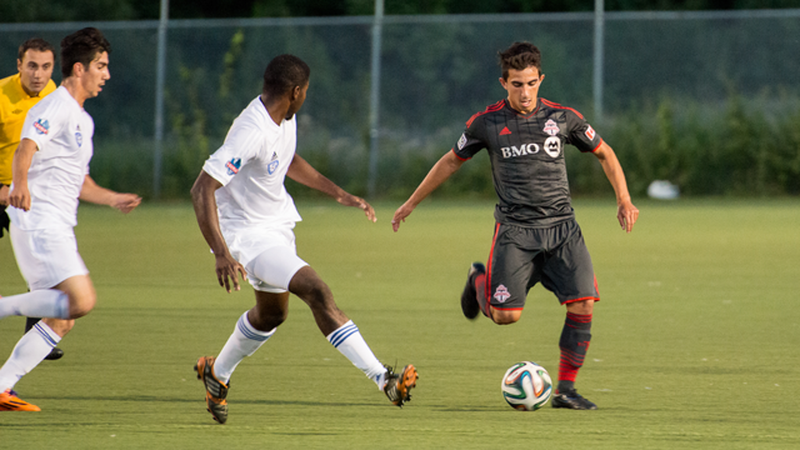 Toronto FC Academy has had its share of memorable performances this season. Still undefeated after ten games the Young Reds are deep and talented at every position. This depth of quality makes it difficult for individual players to stand out. It's a full team effort, after all - something head coach Michael Stefano has stressed all year. Still a brace scored less than a minute apart stands out. That's exactly what Luca Uccello did in an 8-2 romp over the Master's FA Saints on Aug 17. When he added a third goal in the eighty-eighth minute of the contest there was to be no question: Uccello was named the League1 player of the week for his efforts. Although he appreciates the nod, he doesn't move away from the team first approach that TFCA stresses. Uccello deflects the attention onto his teammates and says that he's more focused on getting better and seeing TFCA continue to be successful. Earlier this year, Stefano talked about the importance of Uccello. "He's one of players that's part of a group that has gone through the system together," he said. "He's an important player." Stefano stressed that Uccello is creative on the ball and praised his improvement in linking with other attackers. For his part Uccello is focused on getting better and, like some of his teammates who graduated to TFC's USL affiliate in Wilmington, moving on to the next level. "I just have to keep working hard," he said.